When Canadian general Roméo Dallaire took charge of the United Nations Assistance Mission to Rwanda in 1993, the country’s civil war had halted after more than two years of fighting. Dallaire’s mission was to help both sides implement the agreed-upon Arusha peace accords and transition to a new government. But on April 6, 1994, after the Rwandan president’s plane was shot down, extremists within the Hutu population began assassinating moderate government officials and set in motion the vicious genocide that would ultimately claim the lives of more than 800,000 Rwandan Tutsis and moderate Hutus in 100 days. 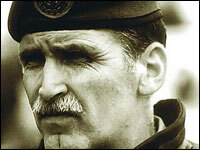 Amid escalating violence, Dallaire faced a nearly impossible situation. The United Nations repeatedly refused to send him reinforcements, and his force shrunk from 2,600 soldiers to 800 as nations withdrew their troops in the first days of the slaughter. Dallaire and his remaining forces stayed, trying to save as many people as they could while the killing continued, witnessing acts so inhuman that the general later suffered severe post-traumatic stress disorder. “Almost fifty years to the day that my father and father-in-law helped to liberate Europe — when the extermination camps were uncovered and when, in one voice, humanity said, ‘Never again,’ — we once again sat back and permitted this unspeakable horror to occur,” Dallaire writes in the introduction to his recent book Shake Hands With the Devil, in which he chronicles the brutality he witnessed as the world simply stood by. Dallaire is now a fellow with the Carr Center for Human Rights at Harvard University’s Kennedy School of Government, where he’s researching ways the international community can respond to future crises. He recently spoke by telephone with MotherJones.com. MotherJones.com: When you were initially deployed to Rwanda, to help implement the peace deal ending the civil war, what did you expect the mission to entail? Roméo Dallaire: It was very much presented as a classic chapter-six mission, which meant that both sides of belligerents had agreed to stop fighting and sign the peace agreement. Their troops were in their trenches with a demilitarized zone. They just needed a referee to make sure that everyone was advancing according to the rules, so it was fairly upfront. MJ.com: In your book, you detail some of the warning signs — such as the stockpiling of weapons — that you discovered from informants before the genocide began. RD: We were getting a lot of information, by word of mouth mostly, from different people. But we did not have an intelligence capability — as U.N. chapter-six missions are not allowed to have, because it’s supposed to be transparent throughout. There’s no hiding and everybody wants peace, so there’s not to be any covert operations or anything. So I was getting information, but I wasn’t allowed to or able to corroborate it. Then in January, three months into the mission, an informant from the extremist militia came to us with a substantial amount of detail and we were able to just check out a couple of his points by sending some of my officers to a few of the weapons caches, and they were there just as he described. MJ.com: When you reported this evidence to the United Nations, how did the leadership there respond? RD: In fact, the report that we did was on 11 January, and we got an immediate response back that I was not to intervene. I had essentially told them that that was my plan, to intervene and to throw the planning by the extremists into a whirlwind by seizing these weapons. So the U.N., through the Security Council, said that my mandate was chapter six and I had absolutely no authority to do that — nor was I allowed to risk it or have the troops to do it – and I had to inform both sides of what was going on. Remember, at that time another factor, not only the technical side, was that [the slaughter of 18 American troops in] Mogadishu had happened just a couple months earlier and everybody was gun-shy. MJ.com: After the Rwandan president’s plane was shot down April 6 and the large-scale killings began, when did you first realize that the situation had changed from purely civil war to genocide? RD: It took about a week, at least a good five days before the planned massacre — we knew by that point there would be a massacre — became firmly something of a massive scale. That is to say, the extremists had moved from killing the Rwandan leadership, the moderate Hutus and Tutsis in leadership, to in fact targeting more and more Tutsis in the general population. And as that was escalating, the foreign troops were being pulled out. Most of my mission, because it didn’t have a mandate anymore and people were afraid that we’d all be slaughtered. MJ.com: In your book, you also describe how Hutu extremists specifically targeted your Belgian troops, killing 10, as a way of pressuring Belgium [Rwanda’s former imperial power] to pull out. RD: Their plan, which we had heard about, was to target some Belgian soldiers. And because the Americans had reacted in such a terrible fashion with Mogadishu — they lost 18 soldiers and pulled out, abandoning all the Somalis — the Rwandan Hutu extremists were convinced that if they targeted the white Belgians, then that would create a catastrophic pullout by the rest of the mission, and they would then have a free hand. The problem was, although [the resulting Belgian pullout] did emasculate totally my mission, I didn’t pull out. So they then moved to a tactic of trying to get me fired, and then simply targeting me with death threats and trying to get at me. MJ.com: As many of your troops were being pulled out by their home nations, how did you change approach with the forces you had left? RD: It moved from the realm of legal orders –because, in fact, I received legal orders from the secretary general to pull out the whole of my forces — into the realm of moral and ethical decision-making. In that situation by then, I had nearly 30,000 Rwandans who were under the direct protection of my small force behind both lines. And we knew that the minute we pulled out, they’d all be slaughtered. So it became a position where I was not going to abandon the Rwandans. And anyway, there was no way I was going to pull out. Even without a force to intervene, I had to at least stay witness and be prepared for a new force to come in. MJ.com: From your dealings with the U.N., what was your sense of why it was so unwilling to reinforce you or send you support? RD: It became very obvious very soon from the office of the DPKO [Department of Peacekeeping Operations], from Kofi Annan and them. No one — absolutely no one — gave a damn. Or, to put it another way, no one wanted to risk soldiers in another “African adventure” where the country was of absolutely no strategic importance to anyone. So they simply applied the “Mogadishu rule,” that, unless it’s in your self-interest, you don’t go and waste resources or risk your people in these conflicts. So led by the Americans, and supported by the British and the French at the time, they simply pulled out and decided not to come back. MJ.com: In the conclusion to your book, you say you believe the genocide could have been prevented had the U.N. acted earlier. What would that have taken? RD: This is where I consider that I failed in my mission. I believe that before the war started, I should have pressed far more. And certainly, my superior — who was the special representative from Cameroon — should have, but he was giving them a completely different picture, a much less dangerous picture than I was. We should have pressed for another mandate to give me extended powers to be able to curtail the insecurity that was mounting. I think that [then-Sec. Gen. Boutros] Boutros-Ghali should have come on the ground and berated all sides in order to advance the peace process. Then, once the war started, it was totally in the hands of the Security Council and the permanent five. Although the permanent three, France, the U.K. and the Americans, emasculated anyone from coming to reinforce us and stop the massacre. MJ.com: While all this was going on, Rwanda was actually occupying one of the rotating seats on the U.N. Security Council. RD: That was an absolute aberration, and I still can’t believe that they continued to let that happen. I would tell them that having the Rwandan ambassador — who was representing the extremist government — sitting on the Security Council meant he had access to all the interplay and discussion in the Security Council. So he was able to give the extremist interim government a much clearer picture of whether people would intervene or not in Rwanda than I was getting from the Security Council through the secretariat. So he was able to maneuver and respond with initiative and permit the extremist government to be in an advantageous position that I didn’t have. I couldn’t believe that they did not at least tell him to leave the room or leave the Security Council for a little while as they were going through this process. MJ.com: After every genocide, the international community resolves on never allowing it to happen again, and yet another is taking place in Sudan. Why do most nations still refuse to take action? RD: Fundamentally, the gain is not there for them and the risks are too high. The gain is not there because the sense of responsibility to human beings is simply not holding water against the self-interested demands imposed by the governments and on the governments by their people and structures. So we’ve simply become more overt with the prioritization of humanity, where some count more than others. And unless there is a gain to be had, then governments will not risk their administrations on potential casualties and difficulties in these complex missions of intrastate conflict in foreign lands. MJ.com: What about a situation such as Bosnia and Kosovo, where the United States and others intervene. Why was that viewed differently than Rwanda or Darfur? RD: It is the residual of the colonial era which has influenced us all. Yugoslavia is white. Yugoslavia is in Europe. Yugoslavia is close to home. We know them, and their security there is a concern. So it is dominated by self-interest and the fact that they’re “like us.” It was also seen as a far more sophisticated exercise because we’re talking about educated people who come from great nations of the past. They’re not simply black Africans who we trivialize by saying that they’re going at each other because they’ve always done it under tribalism. So it is an overt expression of “some people count, and some people don’t count.” We’ll go where they count, even if there isn’t an overt gain, but we won’t go where people don’t count. MJ.com: There were some governments, such as your own in Canada, that did at least send some troops and resources. In future conflicts, what role can these powers play when the Security Council refuses to take action? RD: I think the Security Council blocked the action because they were not pressed to intervene. So, a lot of my current research is in a whole new conceptual base to conflict resolution. We speak of reform of the U.N., and one thing I speak of is a coalition of much more committed and determined middle powers who offer other options to the U.N. than simply the positioning of the big powers. In order to do that, the middle powers have got to come to the U.N. far more generously and far more committed with resources. So Japan and Germany, Canada, Italy and others have got to be far more involved in order to provide the U.N. with other capabilities that don’t call for the big countries to get involved if they don’t want to. MJ.com: You also argue that peacekeeping needs to be redefined in the post-Cold War era. What do you see as the main changes needed to respond to today’s world? RD: I think the term peacekeeping is of another era. Classic chapter-six peacekeeping does not exist. In conflict resolution, we should be looking for far more enlightened leadership, people who are far more multi-skilled, who handle different disciplines in-depth — meaning military, humanitarian or diplomatic/political. I believe we don’t even have the right lexicon to be able to handle these missions. I think that generals who stand there and need clear and absolutely transparent exit strategies and orders are generals of the old era of classic warfare. What you need now are people who can not only fight — because they may need to protect and defend — but people who have a whole new set of skills in order to be value-added in these conflicts. So you need them to have more intellectually based skills like anthropology, sociology and philosophy. There is no such thing anymore as a blue-collar soldier because conflict is far more complex than outright fighting and has so many more traps to it, with ambiguous moral and ethical dilemmas. So in order to prepare troops, you need to bring them to a different plane of competencies than the fighting skills that we know. You need something far more in the psyche of the soldier. I believe that the big powers should maintain themselves as world powers, and not be the first ones in when there is a looming conflict or a crisis. I think middle powers are capable of influencing and creating more flexible diplomats and soldiers to maneuver in that, with the big powers’ oversight. Then, if we move to a crisis that cannot be resolved by the middle powers through the U.N., then intervention with the might of the big powers is required. MJ.com: You said earlier that major powers won’t act if they don’t see a gain for their self-interest. How can public opinion within those nations be mobilized so governments might intervene? RD: The instrument for that, which is still an imperfect and somewhat immature instrument, is the NGO community. The non-government organizations. I think that we must be far more supportive and more serious in the efforts of the NGO communities because I think they will ultimately be the supra-capabilities that will influence public opinion and governments to moving away from self-interest or creating at least a balance between self-interest and the humanitarian side. MJ.com: How did NGOs perform during your time in Rwanda? RD: A whole lot of them disappeared, except for the Red Cross, and the Red Cross lost 56 people. The humanitarians did come back, and some acted brilliantly, but again, humanitarians are a part of the reform that I speak of. For example, a lot of them came in behind the rebel lines and were maneuvered by the rebels, so a lot of their assets wound up aiding, supporting and abetting the rebel cause. On the [government forces] side, because of security, the NGOs did not go in there. So what happened was the NGOs may have been supporting 5,000 people behind the rebel lines, but they were putting 50, 60, 70,000 more at risk behind the extremist lines, because the extremists were getting more aggressive and took more exactations. MJ.com: Looking at the successes you did have in Rwanda and the number of people you were able to save, what worked that future missions can learn from? RD: [The importance of] getting mandates to protect — because I was protecting people but was never given a mandate to do that. And [the need for] diplomats, humanitarians and military personnel who have a far more sophisticated set of skills. When we were able to interact intimately — I mean, I had the humanitarians in my headquarters with me in all my operations and the diplomats, the few that remained — we were able to produce just one integrated plan instead of making three plans and hoping that personalities would make them work. In essence, conflict resolution is not for amateurs.